Lavar Munroe, In a Kingdom of Ignorant Kings, 2018, acrylic, antique funeral fans, rope and spray paint on canvas, 76 x 63 inches. Rodrigo Valenzuela, Mask #1, 2018, archival inkjet print, 32 x 22 inches, edition of 3. Lavar Munroe, Witness, 2018, acrylic, spray paint, parachute harness, rope, bullet riddled sign and collage on canvas, 138 x 82 inches. Rodrigo Valenzuela, Mask #2, 2018, archival inkjet print, 42 x 32 inches, edition of 3. Rodrigo Valenzuela, Mask #3, 2018, archival inkjet print, 42 x 32 inches, edition of 3. Rodrigo Valenzuela, Mask #4, 2018, archival inkjet print, 42 x 32 inches, edition of 3. Rodrigo Valenzuela, Mask #11, 2018, archival inkjet print, 32 x 22 inches, edition 2 of 3. Jenkins Johnson Projects is pleased to present, Disobedience: Lavar Munroe and Rodrigo Valenzuela, which takes protest as a flash-point to explore current social and political unrest. Through new large-scale paintings, photographs, and a collaborative site-specific installation, Lavar Munroe and Rodrigo Valenzuela create a dialogue between their very different styles and mediums. Munroe, from the Bahamas, creates bright and colorful mixed media paintings that integrate found materials, while Valenzuela, from Chile, creates black and white photographs that capture temporary installations. Yet, both artists find a close correlation on how they think about and research their subject matter. Looking at historical figures and current gestures of dissidence against colonialism and capitalism, the artists point to the aesthetics of protest to discuss their own socio-political position in America. In relation to what they have experienced in their native countries, the almost monthly marches in the United States can be critiqued as unhappy obedience with the political situation, rather than protest. Lavar Munroe’s project examines and critiques the journey of the martyr within protest times, specifically looking at acts of self-immolation as statements of discontent. His historical references reach back as far as the 1600’s to Guy Fawkes’ Gunpowder Plot in Britain, Greek mythology, and the Spanish novel Don Quixote. In works like, A Kingdom of Ignorant Kings, he is interested in creating fictitious characters known as The Redbones, who are a generation of young boys placed on the frontline as warriors by the wealthy within society. One of these young boys holds onto an antique funeral fan, referencing death, while a burning man can be seen directly behind it. They ride on a dilapidated cart with the wheels of a Mercedes-Benz, making the disparity between the classes even more apparent. This series draws very close parallels between the current political space and societal ills being experienced today within the world. Drawing on personal experience and history in his native Chile, as well as research about other countries such as Venezuela and Ukraine, Rodrigo Valenzuela’s photographs focus on simple structures and gas masks that people build in times of oppression as expressions of civil disobedience. These images are part of a larger body of work called General Song, after Pablo Neruda’s Canto General, an encyclopedic poetic history of the New World told from a Latin American perspective, which depicts Latin American history as an epic and continuous struggle against oppression. The hand-made gas masks, which appear through his photographs, reference the improvised masks worn by protesters to protect themselves from tear gas and allude to the more brutal physical dangers encountered when enacting change. Lavar Munroe was selected for Trevor Schoonmaker’s Prospect 4 New Orleans and Okwui Enwzor’s 56th Venice Biennale, as well as the 2016 Dak’art Biennale. 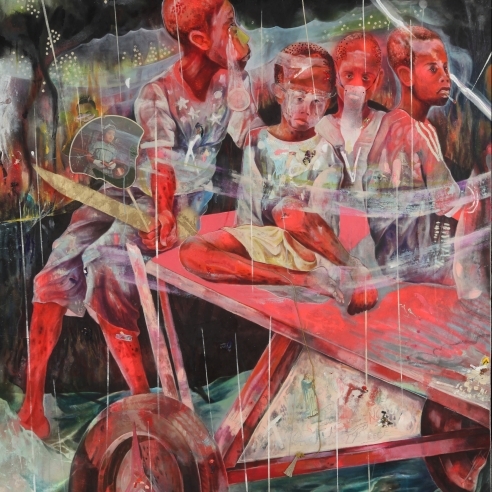 He is currently preparing for a ten-year retrospective at the National Art Gallery of the Bahamas and will be in the upcoming exhibition, African Metropolis at the MAXXI, Museo nazionale delle arti del XXI secolo, Rome, Italy. 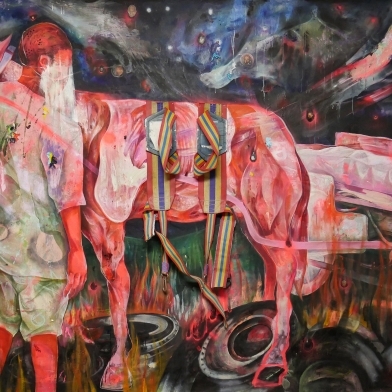 Rodrigo Valenzuela has had notable solo exhibitions at the Frye Art Museum, Seattle, Museo de Arte Contemporaneo, Santiago, and is in the collections of the Samuel Dorsky Museum. His many residences include a Core Fellowship at the Museum of Fine Arts, Houston; Skowhegan School, Maine; Bemis Center, Nebraska; MacDowell, and the Center for Photography at Woodstock, New York, among others. For more information on this exhibition please contact Director, Tess Sol Schwab at 212.629.0707 or nyc@jenkinsjohnsongallery.com.